Fairport native Nick Greco will be back in Rochester to premiere “The 60 Yard Line,” a charmingly goofy indie comedy that tells the story of Ben “Zagger” Zagowski (Ryan Churchill, also the film’s writer), a diehard Green Bay Packers fan who, with the support of his Chicago Bears-loving best friend (played by Greco), purchases a house in the parking lot of Wisconsin’s Lambeau Field and proceeds to convert it into a football fan paradise. Visiting his friends at the house shortly thereafter, Churchill immediately saw the potential for a film and set about working on a script. Writing continued until 2013, when he approached Greco to help with revisions. Friends since their early days performing sketch and improv comedy at the ACME Theater in Los Angeles, the pair’s background helped inform their particular sensibilities when crafting the film’s screenplay. Already a football fan, Greco was eager to help out, though his one condition before coming aboard was that — like Greco himself — his character was allowed to be a Bears fan. In the film’s story, the money Zagowski uses to buy the home had been intended to pay for his wedding to longtime fiancée, Amy (Kim Crossman). As he gets wrapped up in turning the house into the ultimate fan cave, conflict arises when his passion project starts to drive a wedge between him and the woman he loves. To up the drama, Churchill and Greco made the decision to set the story during Green Bay’s 2009 season, when Packers quarterback Brett Favre left for the Minnesota Vikings. To direct, Churchill and Greco brought in their friend Leif Gantvoort, another veteran of their days in sketch comedy and filming began in 2015. The filmmakers were committed to shooting on location as much as possible. 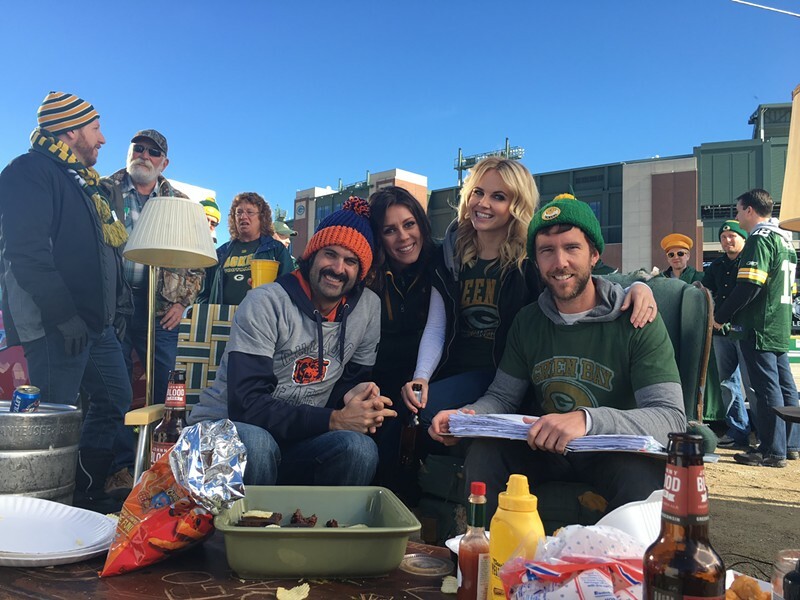 A number of familiar faces show up throughout the movie, including Green Bay players like John Kuhn, Mark Tauscher, and Gary Ellerson. The rest of the cast is rounded out with comedy veterans like Randall Park (“The Interview”), Mindy Sterling (the “Austin Powers” movies) and Chelsey Crisp (“Fresh Off the Boat”), who were all friends through the sketch comedy scene. “The 60 Yard Line” has been playing festivals throughout the year, even picking up several awards along the way. Greco hopes that success continues as Rochester audiences get to experience the film. Now living in LA, Greco says it’s long been a dream of his to come back to Rochester with a film and to play it at The Little Theatre, a place that meant a lot to him growing up. “The 60 Yard Line” screens on Friday, September 29, at 6:30 p.m., and will be followed by a panel discussion with Greco and Churchill. An encore showing is scheduled for Saturday, September 30, at 3 p.m.